New analysis of data from ESO’s Very Large Telescope shows subtle relativity effects. Scientists have applied new analytical techniques to data gleaned from the European Southern Observatory’s (ESO’s) Very Large Telescope (VLT) and other telescopes over the past twenty years. This new analysis of the stars orbiting the supermassive black hole at the heart of the Milky Way reveals movement that deviates from what classical physics would predict, supporting instead the subtle effects predicted by Einstein’s general theory of relativity. The closest supermassive black hole to Earth is the one that rests 26,000 light-years away at the center of the Milky Way, and is four million times more massive than the Sun. 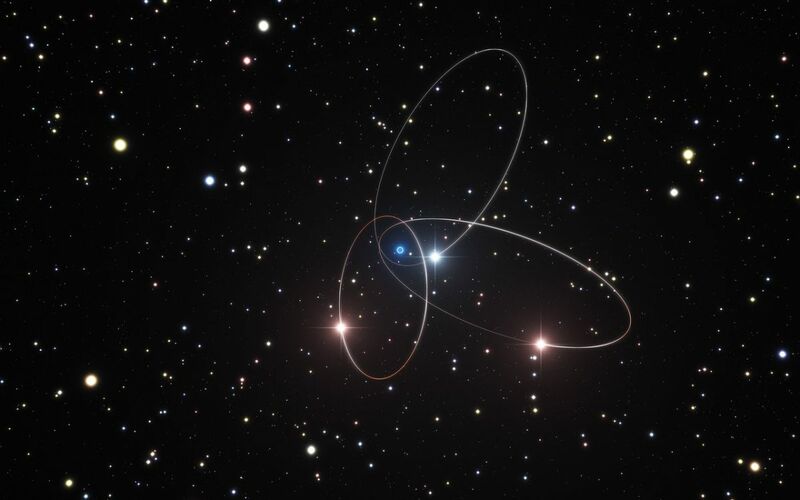 This giant is surrounded by a cluster of stars orbiting in the strong gravitational field of the black hole — the ideal proving ground for Einstein’s general theory of relativity and, more generally, gravitational physics. This is why a team of astronomers has recently applied a new technique to observational data of the stars, comparing the star orbits actually measured with those predicted by both classical Newtonian gravity and general relativity. The team uncovered hints towards a slight change in the motion of S2, one of the stars. The change is small, only about one-sixth of a degree in the orbit’s orientation, and a few percent in the orbit’s shape, but those changes are consistent with predicted relativistic effects. This marks the first time that the strength of the general relativistic effects has been measured for stars orbiting a supermassive black hole. The VLT’s near-infrared adaptive optics instruments provided the highly accurate positional measurements that were vital for the study to succeed. The accuracy of these measurements was essential, especially during the period when S2 was further away from the black hole, because that data allowed the team to accurately determine the starting shape of the orbit and how it changed as relativity influenced it. This new work also provided more accurate measurements of the black hole’s distance from Earth and its mass. This research heralds a thrilling time for astronomers around the world observing the Galactic Center. During 2018, the GRAVITY instrument, installed on the VLT Interferometer, will be ready to measure the orbit of S2 as it passes very close to the supermassive black hole. This should reveal not only relativistic effects with more clarity, but perhaps even new physics, as astronomers detect deviations from general relativity.